County Wicklow is an often overlooked county in Ireland. If you are planning a trip to Ireland take a closer look. County Wicklow is just south of Dublin and holds the promise of something for everyone, from historic country homes and gardens to scenic mountain views and quaint little picture book villages. Starting in the northwest corner, there are two of the finest Palladian mansions in all of Ireland, Castletown and Russborough House. Both houses are rich in architectural detail such as Rococo stucco work , grand staircases, finely worked Italian fireplaces and imposing doorways. Art and antiques also abound with the Beit Art collection in Russborough house being one of the finest masters collection in the country. With Castletown’s first ownership being William Connolly a former speaker of the Irish parliament and Russborough built for the Earl of Milltown many insights into Irish history are offered to those whose interests lie in that direction. After all that art and history your next day should take you across the mountains for breathtaking views and fresh Irish air. One of the main roads through the mountains is the military road built by the British to allow them easy access to flush out the Irish rebels. A rugged landscape, empty and wide with vast colorful expanses of bog dotted with streams and pools. You’ll pass places like Sally Gap and Glenmacnass where the road drops into a glen and a waterfall spills over the rocks. In the distance you will be awed by giant Sugar Loaf Mountain. As you near the mountain you’ll see the signs for Powerscourt and the Powerscourt Waterfall. Although Powerscourt is a mere shell of it’s former self, this is another stop worth taking. Currently the Palladian mansion which burned in a 1974 fire is being carefully restored. However the gardens have always remained in tact and are the finest in all of Ireland. They are truly a magnificent set against the backdrop of Sugar Loaf Mountian. Lunch or tea overlooking this view is a must. As you head south the next stop should be the Vale of Avoca– a beautiful gentle valley at the edge of the rivers Avonmore and Avonberg. Here you can see the “Meeting of the Waters” a lovely park where the rivers meet. 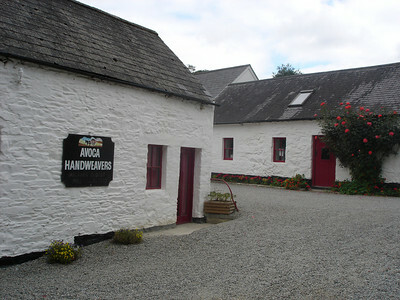 Continuing further down the road is the handweavers hamlet of Avoca. The location of the fictional TV town Ballykissangel. This is the perfect spot for an overnight stay, giving you time to tour the Avoca Handweavers mill and listen to some Irish music in the evening in the pub of the nearby hotel. Two other sites worth visiting in the area is Glendalough and Avondale House. Glendalough is home to one of Ireland’s most atmospheric monastic sites. Founded in the 6th century by St. Kevin, the bulk of the existing buildings are 8th to 12th century. You get a glimpse of life long ago, and enjoy a great outing to hike along the lakes as you pass through history. Avondale House is the home of the great Irish patriot and politician Charles Stewart Parnell. It fast forwards you to the 19th century and lets you get acquainted with the man who led the fight for Home Rule. Beauty, history, gardens and countryside, mixed with Ireland’s colorful historic personalities makes a trip to county Wicklow one with many fond memories.